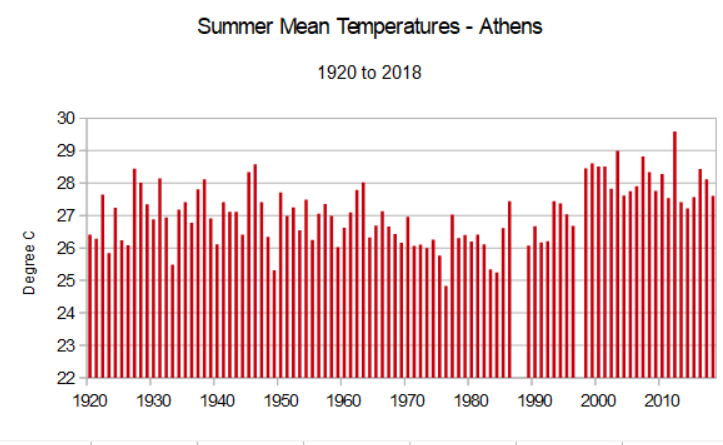 Many blamed climate change for last summer’s tragic fires in Greece. 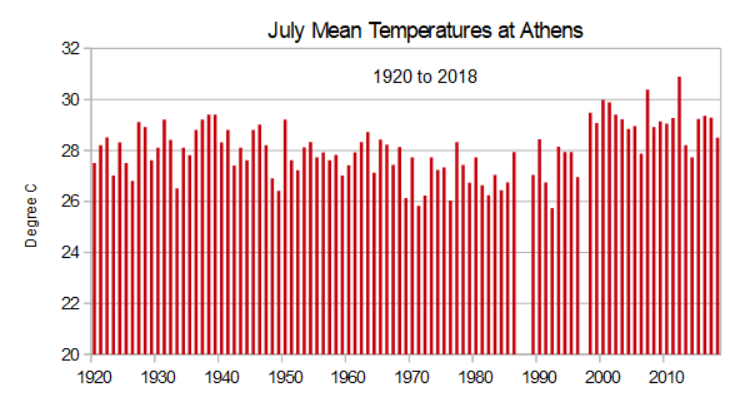 Areas around Athens were like a tinderbox, emergency workers said, after a dry winter and a summer heatwave in which temperatures have risen above 40C. 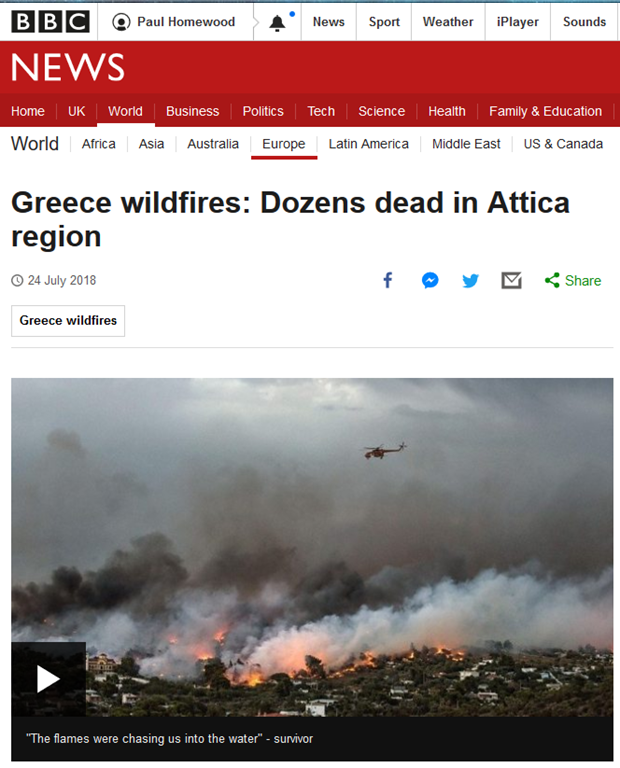 Whilst the above BBC report did not specifically mention a connection, there were various links on the page to “global heatwaves” and “heat records”. Now that the data is in for last year, we can actually check what did happen. Annual rainfall last year was pretty normal, and there is no evidence of long term trends. 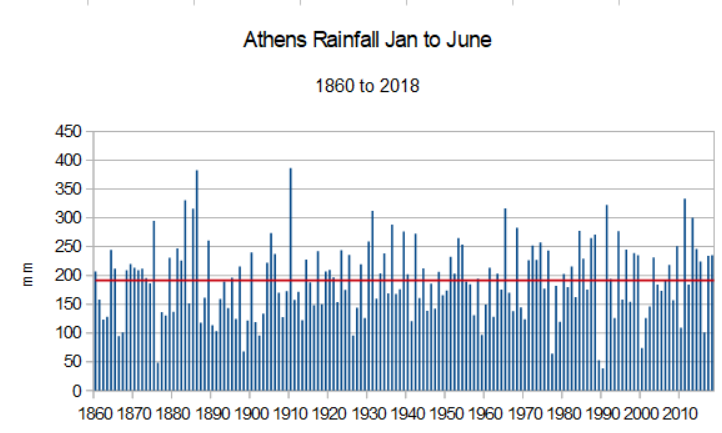 From January to June, just before the fires started, we find that rainfall in Athens was above average. Clearly then, lack of rainfall was not a factor. At least 80 people have been killed in wildfires in Greece, with blazes also reported as far apart as the US, Sweden, Canada and the UK. It’s a summer that has seen an unusually high number of fires in some countries. Worldwide, an area equivalent to about 20 times the size of Great Britain is burnt by wildfires in a typical year. Most are in remote areas such as the savannah grasslands of Africa and South America, or the boreal forests which stretch from western Alaska to eastern Siberia. But we rarely hear about wildfires in such isolated places. It tends to be those which threaten lives, infrastructure, or natural resources that hit the headlines. Indeed, in Europe, the number of fires so far this year is well above average – but not in the countries which are usually worst affected. There were 427 blazes between 1 January and 24 July, compared with an average of 298 for the same period in the past decade. But, very importantly, the area they burned is only about half what is usually seen – 55,700 hectares, compared with 112,000 hectares. In the US, the number of fires this year is slightly below average. However, there has been a small increase in the area burned, from just over 1.4m hectares to almost 1.6m hectares. The most important change is not how many fires there have been, but where they are burning. The north-west of Europe is experiencing a rare heatwave. This has brought unusually dry conditions which have allowed large fires in regions which usually see very few. In the UK the area burned so far – 13,888 hectares – is more than four times the average of the past decade. The fires have included an area of peatland near Manchester and grassland in London. In Sweden, the figure, 18,500 hectares, is an astounding 41 times the 10-year average. Dozens of fires have burned from the Arctic Circle down to the Baltic Sea. Other northern European countries including Denmark, Estonia, Finland, Germany and Latvia have seen between 20 and 200 times the normal area burned. In contrast, Mediterranean Europe – which usually sees a large number of fires – has had a relatively cool and wet spring and early summer. In Italy and Croatia the area burned is well below average. 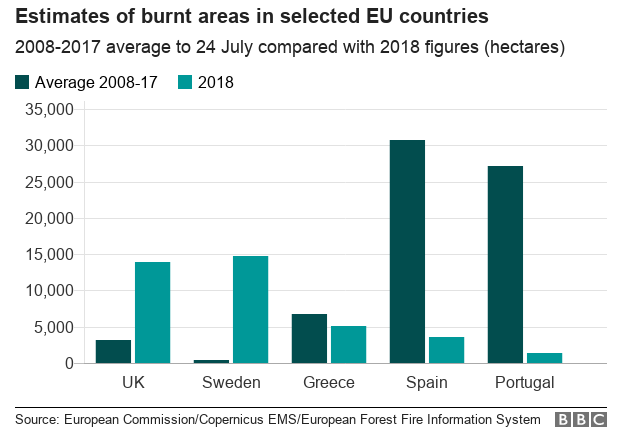 Spain and Portugal, which normally have fire damage over a greater area than any other European countries, have suffered relatively few fires – with only 12% and 5% of the average area burned, respectively. 1) Many fires start in the boreal forests which stretch from western Alaska to eastern Siberia.. It is often claimed that fires in these are unusual, and must be due to Arctic warming. Clearly that is a lie. In other words, last year was not unusual in the least. Similarly in the US, where fire activity was around normal at that stage of the year. 4) Because of the hot, dry weather across N Europe, wildfires were much worse than a typical year. However, across the Med, the opposite was the case, with much reduced burn. Natural ignition by lightning is common in some regions, such as the North America boreal forest, but in Europe the vast majority of fires are human-caused. The deadly fires in Greece are a prime example of weather being only one important factor. Until a few days ago, Greece had experienced fewer fires than is typical. But, in a densely-populated region near Athens, the presence of villages and towns amid highly-flammable pine forests and shrubland has had tragic consequences. In recent decades, there has been an increase of "megafires". These are too big and fierce to be stopped, irrespective of the efforts and resources thrown at them. While climate change may have made more fuel available for such fires, human behaviour has also played a role. In many rural areas of Europe land has been abandoned – leading to the growth of more vegetation close to and among homes. People often enjoy living or holidaying in forest areas, which also increases the risk of being directly affected by fire. Fortunately, it is possible to reduce the risks this poses – by clearing "fuel" close to buildings and building fire shelters in areas where the population might need them. Educating people about the risks and having evacuation plans in place can also reduce the threat to human lives and the economy. We need to adapt and learn how to coexist with fire. Fire has been transforming the Earth’s landscapes and vegetation for millions of years. 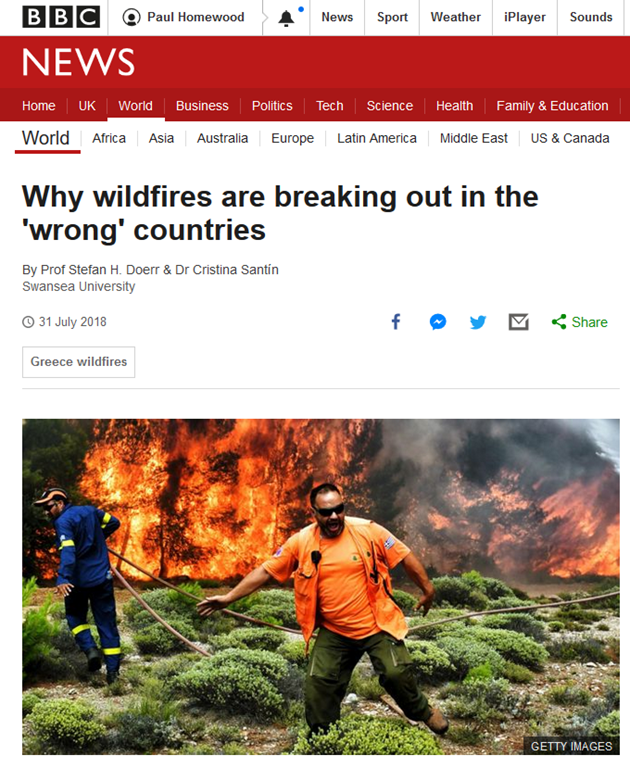 And in a report a couple of weeks ago, the BBC noted that a 65-year-old man suspected of having started the wildfires after he burned wood in his garden is also facing charges. I wonder whether David Attenborough will offering any of these truths in his propaganda stunt, or if he will stick to the “blame it on global warming” lie? Fires are an integral component of ecosystem dynamics in European landscapes. However, uncontrolled fires cause large environmental and economic damages, especially in the Mediterranean region. 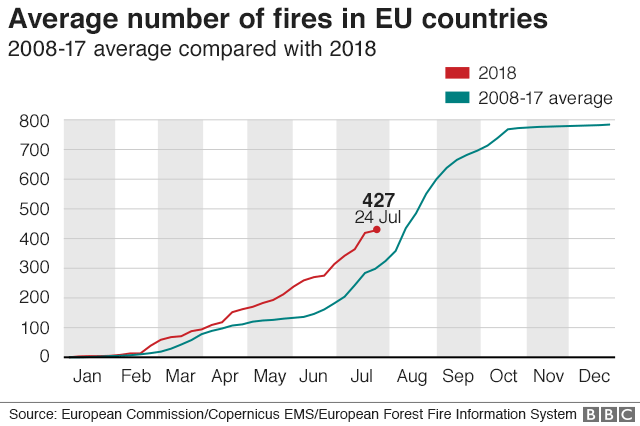 On average, about 65000 fires occur in Europe every year, burning approximately half a million ha of wildland and forest areas; most of the burnt area, over 85%, is in the European Mediterranean region. Trends in number of fires and burnt areas in the Mediterranean region are presented in Fig. 1. Recent analyses of the available data in the European Forest Fire Information System (EFFIS) show that over 95% of the fires in Europe are human-induced. The split of causes shows that most of them are due to misuse of traditional practices of straw burning of shrub-burning to recover areas for cattle feeding. How does a moorland fire start after dark as happened on Winter Hill just north of Bolton? Twice. It’s human activity alright, deliberately so. This is a species that propagates by forest fire, which allows its seeds to germinate whilst clearing away the competition. It sheds vast quantities of flammable bark and dead leaves. The way you ameliorate eucalyptus bush fires here in Australia is to do regular and consistent fuel reduction burns in the cooler months. That is expensive and labour intensive. There is no way that the dysfunctional Greek government could do such a thing. Portugal planted eucalyptus which came back to bite them a while ago when they had some big fires. 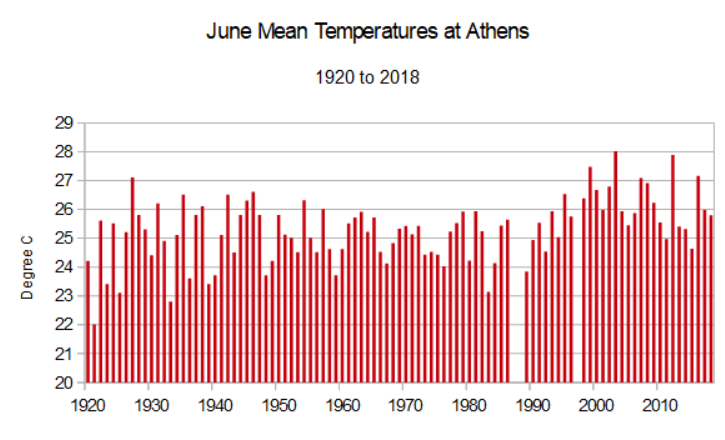 The average summer temperature in Athens certainly appears to be higher in recent years. The Atten used to be great, loved the programmes and have several of his books, from years ago. But, since he abandoned science I have no respect for him at all. I assume everything he says now is nonsense so ignore his output completely. Which is a waste of the talents of those doing the filming. Yes: Atten is a brilliant wild life presenter; but as for his climate politics he is nowt but a well paid parrot.